With 2017 just hours away, Broker-Dealers anticipate the new year will include a resurgence of IPO activity as well as a material uptick in private placement offerings, stimulated in part by initiatives led by the Trump Administration. With this refreshing outlook, BrokerDealer.com curators will be providing a series of thought-leadership articles submitted by financial industry experts and professional service providers who counsel industry innovators and accomplished entrepreneurs. Below “2017 Best Practices for Private Placement Memorandums” is the first of weekly articles that will be posted via BrokerDealer.com.. Private Placement Memorandum: A Startup’s best friend for attracting investment. If you are looking to raise capital for your business, you will inevitably need to utilize a document known as a private placement memorandum (PPM). This is a legal document that you can use to list down disclosures and selling points of your business for prospective investors. It is also known as offering document or offering memorandum. 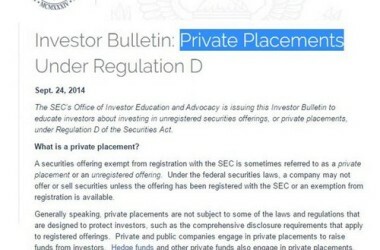 When do you use a Private Placement Memorandum? When it comes to selling equity in your company or raising capital via a debt offering for private enterprises in the United States, one needs to be more than familiar with and to follow the rules set forth by the Securities Act of 1933. This requires you to register yourself with the Securities and Exchange Commission (SEC). One of the core elements of the documents you must submit is to explain why the offering made by the business complies with SEC Regulation D, which allows exemption for some companies from registering with the SEC. Regulators in Europe and other regions typically impose similar and sometimes more rigorous standards. A PPM is a serious invitation for thoughtful and focused investors who want to know about your business, its future and most important, the profits that they can earn from it. If you go for ready-to-use templates from unreliable sources, you will likely end up with a dry, conventional PPM that will have numerous legal loopholes, which in turn can get you into trouble. There are a variety of professional services focused on creating a bespoke PPM. This document will be tailored for your business and its prospective investors. The writer will work with you directly and use the information that you provide, ensuring that the final product highlights your company, its potential and why investors should take it seriously. When you enlist professional PPM writing services, your business will be thoroughly analyzed by experts who will have a full understanding about your enterprise, along with identification of all the legal risks that can be obstacles for investment. They will also be able to identify the best possible approach for your business under the Regulation D of the SEC. Will my lawyer help me in creating PPM? A Private Placement Memorandum is a legal document. Using an experienced securities lawyer or a professional service provider specializing in the creation of investor documents makes good sense. However, while the PPM serves as a legal document; it is also a business marketing tool for you to attract investors. A lawyer should be able to draft a foolproof legal document, but in many cases they will lack in the creative thinking that is required to make your PPM attractive. Professional service providers who specialize in private offerings should offer you advice, consultancy and insight about the best practices when it comes to attracting investors. They have presumably worked on PPMs for companies across a variety of industries, and ideally have cross-border experience to address the needs of Issuers based not only in the United States, but in multiple global jurisdictions as well. By choosing the right professional consultant, you will be working with people who actually know how to leverage a PPM document to raise equity for your company. Contributor Samuel Goldberg is a 20 year private finance and investment banking veteran who currently serves as an independent consultant and a Board Advisor to PPM Group, a global advisory with offices in New York, London, Hong Kong and Tel Aviv. His knowledge base with respect to private placement documentation, capital formation and business consulting is based on dozens of projects in which he helped negotiate term sheets for multiple public offerings and private issuances that have raised nearly USD $2.5billion for a broad spectrum of companies. Mr. Goldberg’s area of expertise encompasses Reg D, Reg S and 144A issuance, stock exchange listing services, as well as the EB5 market.